Two independent research teams have identified a mutation in the gene for chromosome 9 open reading frame 72 (C9ORF72) as the most common cause found to date of familial ALS (amyotrophic lateral sclerosis),frontotemporal dementia (FTD) and ALS with FTD (ALS-FTD). The investigators further determined that the mutation — an expanded section of DNA known as a repeat expansion — accounts for a significant percentage of cases of sporadic ALS, at least in some populations of people with the disease. The mutation appears to be responsible for approximately 30 percent of familial ALS cases and, conservatively, 4 percent of sporadic ALS cases in North America. Familial (inherited) ALS accounts for about 5 to 10 percent of all ALS cases, with the other 90 to 95 percent occurring sporadically (without a family history of the disease). Approximately 50 percent of people with ALS have some degree of cognitive or behavioral impairment, but only about 15 to 25 percent of patients meet the criteria for a clinical diagnosis of ALS-FTD. Results of the two studies were published online Sept. 21, 2011, in Neuron. 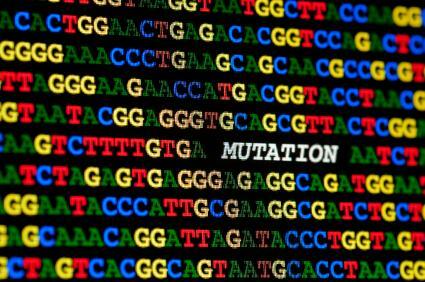 The newly discovered mutation belongs to a class of mutations called repeat expansion mutations. A repeat is a string of nucleotides (the bases, or building blocks, of DNA) that occurs sequentially multiple times in a given stretch of DNA. A repeat expansion occurs when an error causes the number of repeats to increase. The chromosome 9-linked ALS-FTD mutation is a hexanucleotide repeat expansion in which a “six-letter” string of nucleotides coded GGGGCC is repeated far more times in people with ALS, FTD or ALS-FTD than in people unaffected by either or both of the two disorders. The maximum number of hexanucleotide repeats in people unaffected by ALS appears to be approximately 20, with an average of around three. Although the exact numbers of repeats in individuals with ALS, FTD or ALS-FTD has yet to be determined, investigators from one of the two studies suggested a possible range of 700 to 1,600. This is first time a repeat expansion mutation has been found to directly cause ALS, although a repeat expansion in the ataxin 2 gene was recently identified as a significant contributor to the risk of developing ALS. Because these expansion mutations have been implicated in a number of other diseases, they've been the subject of a great deal of research. Scientists, some with MDA support, published study results as early as 2000, definitively linking ALS, FTD and ALS-FTD to a region of chromosome 9. Previous studies also linked gene variants in this region to sporadic forms of both ALS and FTD. But the specific genetic flaw responsible for the disorders has gone undetected until now. Both teams reported that the C9ORF72 mutation is the most common known cause of inherited ALS and FTD. Data from the studies indicates that the C9ORF72 mutation is more than twice as common as mutations in the superoxide dismutase 1 (SOD1) gene as a cause of familial ALS, and more than three times as common as mutations in TAR DNA-binding protein 43 (TARDBP, or TDP43), fused in sarcoma (FUS), optineurin (OPTN) and valosin-containing protein (VCP) genes combined. "Until now we knew that mutations in SOD1 accounted for approximately 20 percent of familial ALS and that mutations in all other known ALS-associated genes combined accounted for, at most, another 10 percent," said neurologist Michael Benatar at the University of Miami Miller School of Medicine. "Mutations in C9ORF72 probably account for 20 to 30 percent of patients with familial ALS. Benatar, who received MDA funding for his contribution to this work, added, "Moreover, we now know the genetic cause of ALS in the majority — 50 to 60 percent — of patients with familial ALS." "Mutations in C9ORF72 appear to be the cause of sporadic ALS in about 20 percent of patients with this disease in Finland. Whether — and how frequently — such mutations cause sporadic ALS in the United States is not known, but is an area of active research," Benatar said. Study results indicated that a conservative estimate for this mutation in North American cases of sporadic ALS is around 4 percent. "If the finding that this mutation in C9ORF72 is responsible for a significant proportion of patients with sporadic ALS, then a whole new array of approaches to developing treatments for patients with ALS becomes apparent," Benatar said. Neurologist Bryan Traynor, head of the Neuromuscular Diseases Research Unit at the National Institutes of Health in Bethesda, Md., coordinated a large team of researchers based in Canada, Finland, Germany, Italy, the Netherlands, the United Kingdom and the United States. Traynor's team conducted studies first in a Finnish population of people with either familial or sporadic ALS, along with members of one ALS-affected family each from the Netherlands and the United Kingdom. The team then studied ALS patients of European descent including people with familial ALS from Germany, Italy and North America. A second team of researchers based in Canada and the United States included corresponding authors Ian R. Mackenzie, a professor of pathology and laboratory medicine at the University of British Columbia, Vancouver, Canada, and Rosa Rademakers, associate professor of molecular science at the Mayo Clinic Florida in Jacksonville. The Mackenzie-Rademakers group studied a group of people with familial FTD or ALS from Vancouver, B.C. ; San Francisco; and Mayo Clinic sites in Florida and Minnesota. An immediate implication of the new findings will be the development of a genetic test for the C9ORF72 repeat expansion. Genetic test results could inform individuals, families, caregivers and physicians about the probable course of the disease and aid in early decision-making. The association of C9ORF72 with ALS and FTD also provides an additional avenue of investigation into the molecular mechanisms underlying the two disorders, and may help scientists pinpoint therapeutic targets and design potential treatments. To see a video of MDA Vice President of Research Sanjay Bidichandani further discussing this new ALS finding on MDA's YouTube channel, visit http://youtu.be/0NFUiWjz-j8.